We were finding that at times nothing happened when we clicked on the screen on the Brother Scan n Cut and we thought that the machine wasn’t working as the pointer had to be off to the side to allow us to make a selection. Well we found that this was happening because the screen had moved out of alignment. 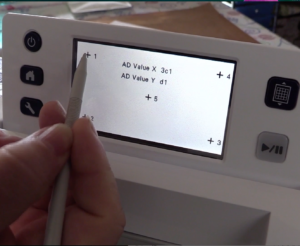 In this video we show you how to make the adjustments in your Brother Scan n Cut so that the screen is aligned. Its easy to do and will it set your mind at ease knowing it’s something so simple to correct. We have been trying out cutting fabric on a standard mat without the contact sheet applied to it. We spray with a bit of 505 Spray Adhesive to the fabric and place it on the mat. (Just a light spray). It has been working really well and in fact it is now our favourite way to cut fabric.